The idea is as brilliant as it is simple. Take two different materials, combine their qualities and design a car on top of their benefits. 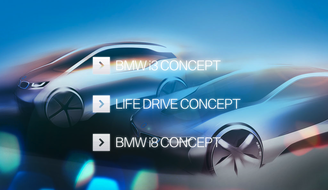 This is what BMW did with the LifeDrive concept. To get the people introduced to the idea, BMW needed a short and simple animation that is easy to understand and gets down to the nitty-gritty in no-time. So we complemented a car skeleton with an animated loop to emphasis the concept of the two independent modules and their functions in the BMW i. prototype cars. The exhibit was featured alongside the BMW i BORN ELECTRIC TOUR with stops in Rome, Düsseldorf, Tokyo, New York, Paris, London and Shanghai. And furthermore it became a permanent companion at the regular car fairs. Shaping carbon fiber and aluminum around a concept for future mobility.